A low-carb diet of 100 g a day can help you lose weight and improve your blood lipids, according to a study published in the May 2004 issue of "Annals of Internal Medicine." To keep it simple, you could aim for 30 g of carbohydrates at each of your three meals and consume 10 g of carbohydrates at a snack. Eggs, smoked salmon, sausages, bacon and cheese do not contain any carbohydrates. To complete your breakfast, you can add 1 cup of spinach and 1/2 cup of mushrooms to your scrambled eggs, along with 1 cup of strawberries and 2/3 cup of plain yogurt for a total of 30 g of carbohydrates. Alternatively, you could have 1/2 cup of oatmeal mixed with 1/2 cup of plain yogurt and 2 tbsp. of peanut butter for 30 g of carbs. For lunch, you can fill up on leafy greens and salad vegetables. Even if you have 2 to 3 cups of salad, your carb intake will not exceed 5 g of carbohydrates. 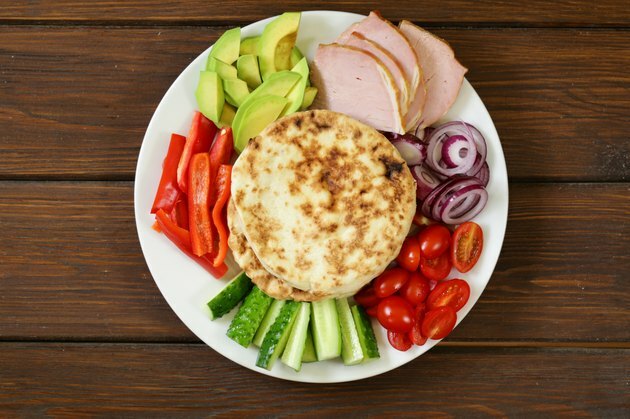 Add a chicken breast, canned tuna, sliced beef, eggs or cheese to get your protein and avocado, bacon, olives, an olive oil-based vinaigrette or a salad dressing to get your fat. Get your remaining 25 g of carbohydrates by completing your salad with a few whole-grain crackers and a small piece of fruit or about 3/4 cup of fruit salad. You could also make a small smoothie with 1 cup of milk, 1/4 of a banana and 1/3 cup of fresh or frozen blueberries. To keep your carbs to no more than 100 g a day, have no more than 10 g of carbohydrates at your snack. For example, you could have about eight baby carrots with 2 tbsp. of hummus, two to three celery sticks spread with 2 tbsp. of almond butter or peanut butter, 1 cup of strawberries, 1/2 cup of plain yogurt or two to three squares of dark chocolate. To stay within your carbohydrate allowance of 100 g a day, aim for 30 g of carbs for your dinner. Start by choosing non-starchy vegetables. Two cups of broccoli, cauliflower, red bell pepper, asparagus, tomatoes or a mix of these vegetables contain about 10 g of carbohydrates. Beware of tomato sauce; it usually contains up to 20 g of carbs per cup, so check the label. Combine with protein from beef, pork, seafood, fish or poultry and fat from olive oil, cream or butter. You can get your remaining 20 g of carbohydrates from either a little less than 1/2 cup of cooked rice or pasta, 1 cup of cherries, or 1/2 cup of plain yogurt mixed with either 1/3 cup of unsweetened applesauce or 1 cup of raspberries. What Is Good to Eat for Breakfast on a 1,200-Calorie Diet?